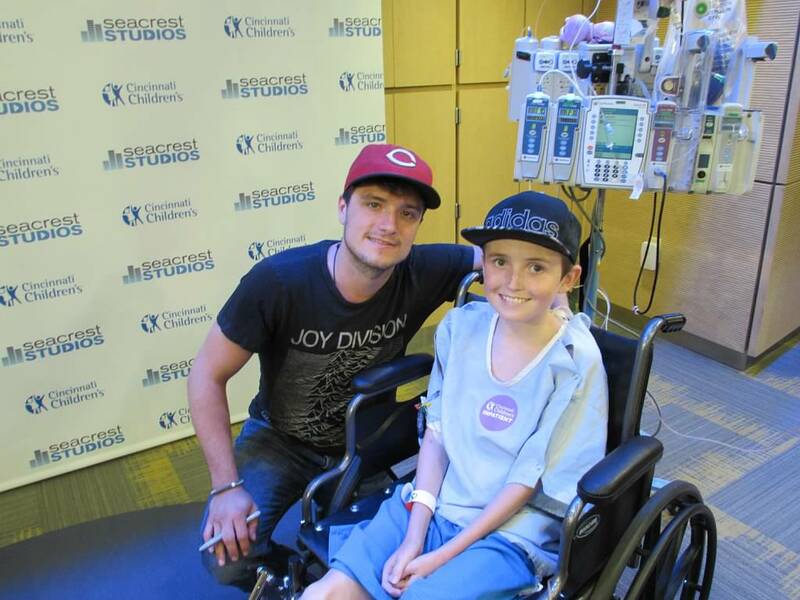 Recap By: Seacrest Studios Intern, Abby Seitz --- Seacrest Studios at Cincinnati Children's was thrilled to welcome The Hunger Games star Josh Hutcherson. Hutcherson was back near his hometown of Union, Kentucky, to play in the All Star Celebrity softball game. Hutcherson enjoyed meeting the crowd and even took a few selfies with some star struck patients. One patient even had to compose herself, saying “First of all, I love you!” before asking her question. The studio was filled with excited patients who asked questions about Hutcherson’s role of Peeta Mellark in The Hunger Games. Hutcherson shared that his favorite part of Peeta’s relationship with Katniss Everdeen was how much they cared for each other. The crowd loved hearing about Hutcherson’s most memorable and favorite moments of filming. Hutcherson said that his favorite Hunger Games movie to watch is the first Hunger Games, but his favorite to film was Catching Fire. While playing the game “Heads Up!”, the crowd was able to give Hutcherson clues by acting out charades, and giving him hints as to what object was on his card. Hutcherson was able to quickly guess each object with so much support from the crowd. After guessing the card Batman, Hutcherson shared his love for Batman, and how he used to dress up as Batman when he was younger. Hutcherson also shared with the crowd some tips about staying positive when life gets tough. “Focus on what you love and what your passion is, be it music, family, sports, painting or drawing, everyone has their own thing. Try and always keep a positive perspective and remember all the great things you have.” After the games and questions, Hutcherson made sure every patient had the opportunity to get an autograph and take a personal picture with him. It was an amazing day for our patients and families. Thanks Josh!